Amy and I tested each others patterns in preparation for their publication in Fat Quarterly Issue 8 Paper Piecing Issue (available today!). I smiled so much when I saw her wonderful vintage skate design. I loved the shaping and I knew just what I was going to make with it. This was my friend Kathy's Christmas present. Kathy grew up in Michigan and skating on the lakes was a regular winter pursuit. Now this hoop hangs on on a little gallery that I have got going on in there kitchen along with the man mat and a mini teeny tiny pieced mug rug quilt. What you can't see is the pretty dusky pink Sevenberry flower print on the back- Kathy is not one for flowers but I got some in there, she even confessed to liking it. And of course she has turned the vintage ribbon round to the back, too fussy for her! But I know she and the family love it! making a quilt for my sister, there have been casualties along the way. 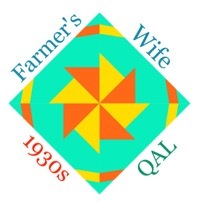 Quilt making is not my strongest sewing skill, it always feels like war- me versus a big mound of batting and fabric, wrestling it through the machine. This is a very exciting week, I have a pattern published in Fat Quarterly Magazine! This issue is all about piecing and there is a huge range of piecing patterns from simple to advanced. My pattern is for a teapot block and I have written two ways to piece it- freezer paper template style and foundation. 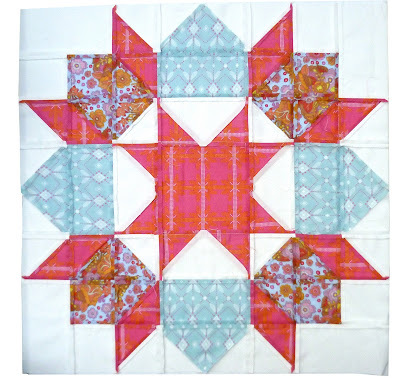 It is a great pattern if you are new to piecing as I take you through both methods step by step. 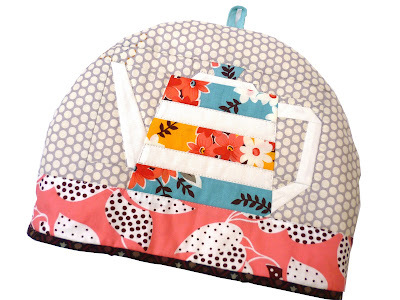 I have designed a simple tea cozy for the finished blocks but you could make it with a different block or just out of patchwork fabrics. This cozy should be big enough for a 4 cup teapot. Finished size 9" tall, 12" wide. Make your quilt sandwich with 1 piece of batting and your quilt block. Spray the batting and lay your quilt block on top, repeat for the other block. Quilt blocks as desired. Find centre point along top and bottom edge of each block and mark with pins. Place pattern on the centre pins and using pencil or erasable marker, draw round pattern piece, flip over centre and draw round again. You should have a semi circle type shape. I added a little had hand sewn detail around the spout for steam after I had drawn round the template to make sure it would fit. Cut out the semi circle and zig zag round the edge of front and back. Repeat the process in step one for lining. I kept my quilting simple and wide so there would be lots of space in the batting to trap heat and keep tea warm! Use the template, cut out and zig zag as in step 1. You should now have a front and back outer and front and back lining pieces, 4 pieces in all. From a scrap cut a bias strip 1.25"x4". Fold in half lengthways so the long edges meet, press. Open out, bring the long raw edges into the centre and press along the folds so your strip looks like the picture below. Bring the folded edges together, press again and stitch along the edge. On one of the outer cozy pieces, find the top centre point, loop the bias strip and place either side og the centre point with the loop facing inwards. You can adjust the size of the loop to whatever works for you! Stitch the loop to the top of the cozy stitching within the quarter inch seam allowance. Taking the two cozy outer pieces, place right sides together, pin around edge and sew using a quarter inch seam all round. Repeat with the lining but sew a scant 3/8"seam. This will make the lining a little smaller so it fits nicely inside the cozy. Clip curves on outer and lining seam. If you are nervous about cutting into your seam, place a pin just in front of the stitches to stop your scissors snipping your stitches. Press open the last 2 inches of the seam at the bottom edge of the cozy on the outer and on the lining (see picture below). Turn outer cozy the right way out and lining so the wrong side is out. Place the lining inside the cozy outer, wrong sides together. Pin at the pressed open side seams. Stitch all round the bottom edge within the quarter inch seam allowance, about eight inch from the bottom. Follow my Single Binding Tutorial to add binding around the bottom edge and to complete your cozy! 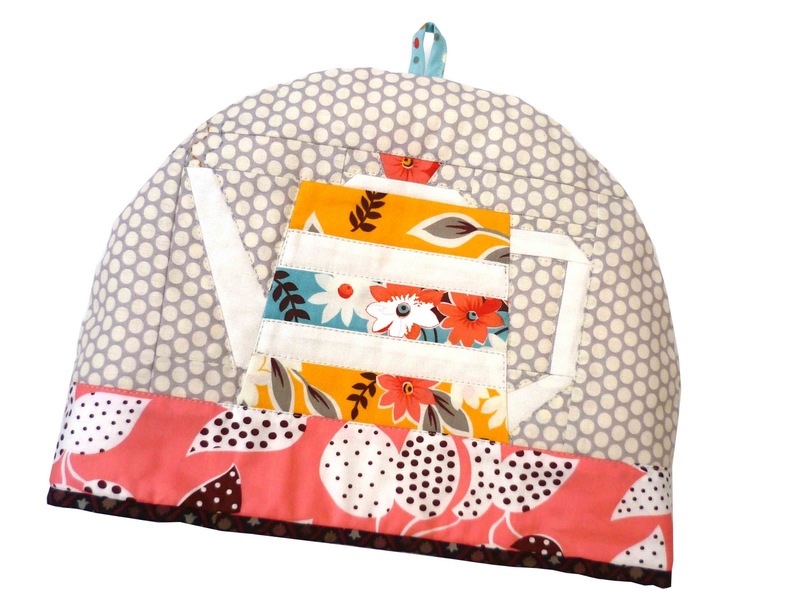 The teapot beside my cozy was my original inspiration for the teapot block! If you make the block or the cozy I would love it if you could add it to the Fat quarterly Flickr group and the Made it With verykerryberry group, and if you have any paper piecing questions please ask, I will answer in the comments thread below so others can read too! Time for a brew, earl grey for me and maybe a read of Fat Quarterly. Issue 8 goes on general sale 31st January and subscribers get their issue codes from today. 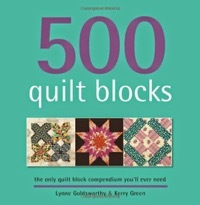 A lot of paper piecing friends have their project in this issue, some I have seen and some I haven't can't wait! 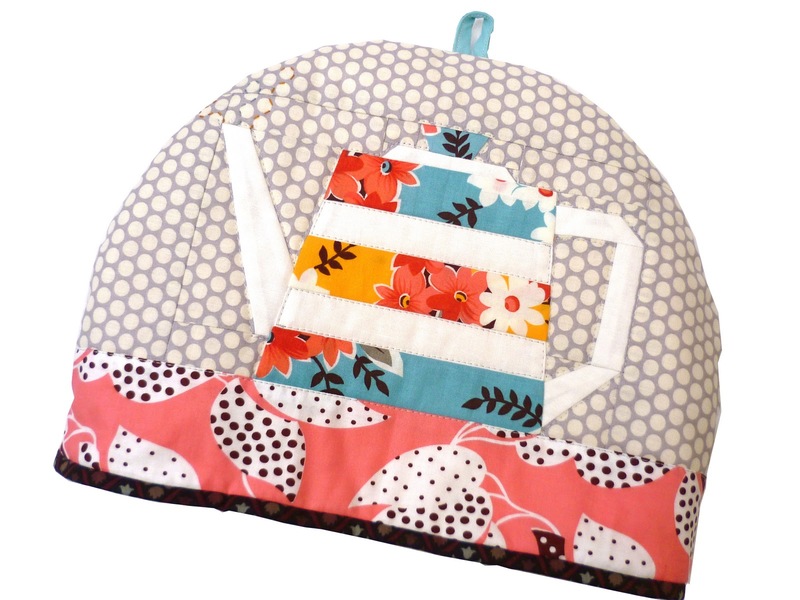 I meet so many lovely people in the online sewing world and every now and again I meet someone I really click with and I can imagine having a cup of tea with whilst swapping ideas and talking fabrics. Amy is one of those people and we conspired a little swap to follow the rush of Christmas- we have both received our packages so now its show and tell. Look what I have to show- the cutest little Dresden bag and matching coin purse adapted from Amy's free pattern. This is a bag with a purpose. When I teach music in school, I have a little bag with remote control, throat sweets and other vital bits and pieces. My current bag is a sad and sorry denim patch pocket, well worn so Amy made a replacement. It needed a strap large enough to cross my body- we move around a lot in music! You can see me in my work clothes below- the bag is perfect and its little coin pouch partner fits inside! Both have just the right amount of grey to fit in with my sober serious Mrs Green attire ( gotta have some sort of authority) and the pops of colour make me smile and my eyes glint each time I look at it! The tiny pouch is the cutest thing with its mini dresden petals! I can only imagine how fiddly this was for Amy to make. And Amy included some of her screen printed My Happy Place print (available in her shop) Such a crisp and neat print on the softest linen. And a cathedral windows card- this shape really makes me think of Amy! It is a tricksy pattern to do with all those curves and I did it the worng way roung and the texts weren't reading how I wanted them to read so the quick unpic came out- but all worked out! We both added a personal touch with initials! Fabrics are Japanese linen, Yuwa print and vintage flowery fabric scraps. The lining is a Suzko Koseki print. I drafted the purse pattern myself using Lisa's helpful hints at U- handbag and the frame is from Cotton and Cloud. I found an interesting fabric panel just before I started this swap that I thought would suit Amy. It is a fine cotton with a lovely text print- I have no idea what it was for, emboridery maybe, but the print stayed on after I washed it. It was a large rectangle, big enough to make a decent size lined drawstring bag. The ties are vintage bias binding. A little while ago, maybe a year or so, a friend bought an old Ladybird book, Making a Transistor Radio. Inside were the usual evocative illustrations including a great colour block image of radio resistors, an idea hatched but it has taken till now and a big birthday for my friend James for me to realise it. The design is straight from the book, I love radio but have no idea what it means beyond a colour coding system. That doesn't matter, James knows what it means and I like the way it looks. A mini quilt, mug rug, man mat- whatever, it is on the wall in their family kitchen with some other makes from me in a mini gallery. 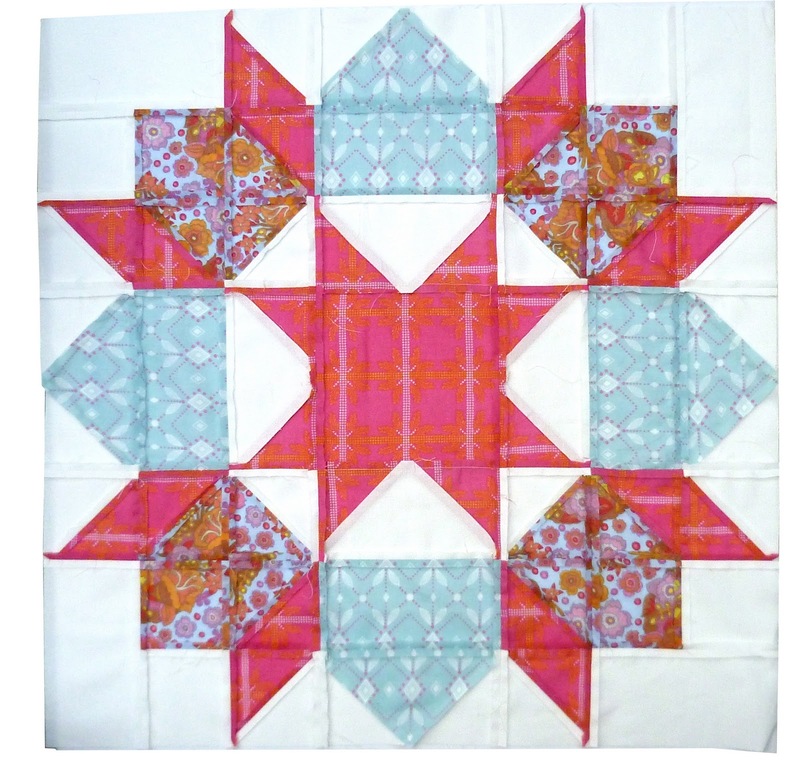 The colours are from a Kona rainbow charm pack, the gold and salmon 'Tolerance Colours" are from vintage scraps. I have no % symbol in my stamps so I improvised, need often makes for inventive moments. Versacraft ink as usual for the stamping. The back is a funny Japanese text print all about String theory and other rather weird references. The whole thing is only 9" x 7". Fun to make and well received. The same book had this , what a great little source of inspiration. 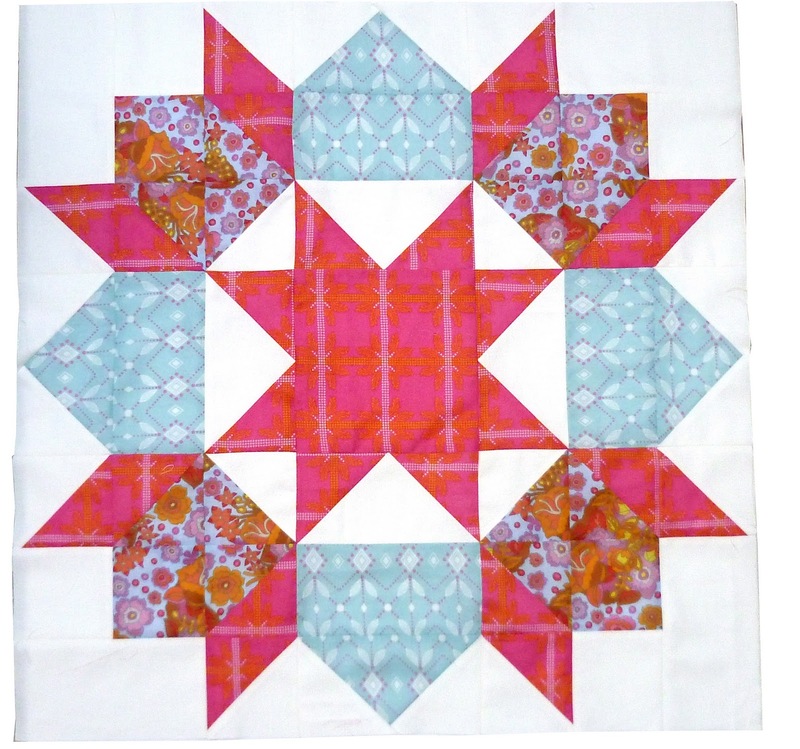 It is an easy design from Jane Brockett's Gentle Art of Quilt Making, squares, rectangles and all about the fabrics. These are very Gemma! Also planned- lots of clothes. At least 1-2 dresses- we have a wedding to go to in April so one or both of those voiles has got to become something and there are a couple of skirts in those bolder prints below. I decided to make all skirts rather than buy, that way I get the details I really want, like pockets. There are more clothes planned, no idea when I am going to get the chance but one day , this year, hopefully. Also have a few paper piecing projects in the pipeline, some very close to reveal-the photo is the tiniest peek, and the Fat Quarterly retreat to go to and teach at- it is going to be a great year although having seen the other teachers I am more than a little nervous. At last I found a little window of time to make my first Swoon block. All the support and inspiration you could even need is in Katy's Swoon Quilt A Long group on Flickr. This project would never have started without it. Pins are definitely needed with the voile. Along the way I must have 'lost' a square here and a piece there a 100 times. I enjoyed this a lot more than I ever imagined I would. 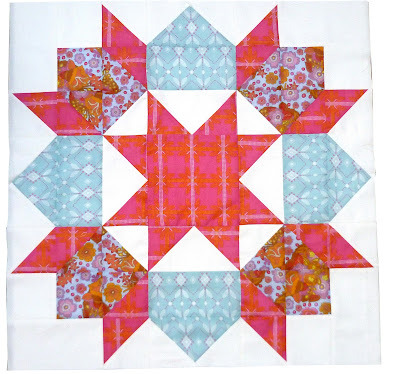 The block design is simple but very effective and is just what I was looking for with the Little Folks- I know many of you suggested Swoon when I asked what I should make with these fabrics. Cutting does take ages but I am working only one block at a time so it is easily manageable. 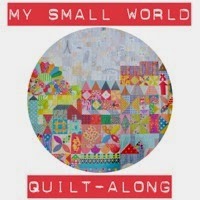 It is a whopper, a mini quilt in itself, 24.5" x 24.5. I am going for the full 9 blocks but slowly, slowly. Pressing the seams open is worth the extra effort and made joining a lot easier. The thiness of the voiles really helps and they have a lot of give, handy when I am trying to match up points. I am actually bursting to make another but I I have promised my sister a quilt for her birthday, end of February so more Swooning will have to wait. Today I am a guest at Sew we Quilt, sharing my thoughts on tools. I would appreciate anyone dropping by and having a read! Making this traditional basket block was a good tester for all of them- the bias strip handle hand sewn on especially! This block is a Kumiko Fujita design from a magazine she contributes to but the Farmer's Wife sampler quilt has the same basket on point. The background is Denyse Schmidt, the basket is Japanese linen print and a little Suzuko Koseki print and the headscarf girl in the corner is a Kei fabric. The gingham is vintage.